Many people don’t know that having diabetes increases the chances of having heart problems, such as a heart attack or stroke. 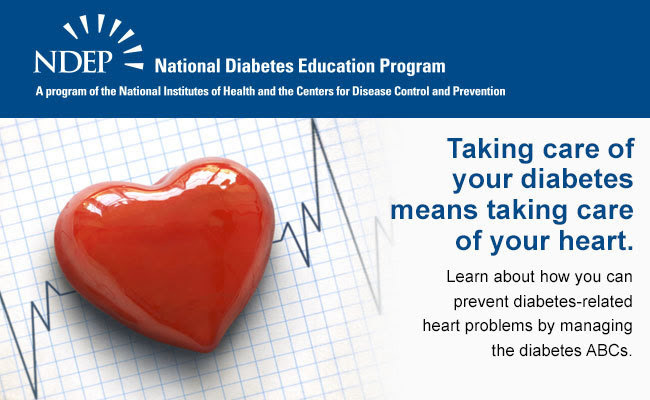 The National Diabetes Education Program wants you to understand that taking care of your diabetes can also help you take care of your heart. A is the A1C Test: The A1C test is a blood test the measures your average blood sugar level over the past three months. B is Blood Pressure: Blood pressure is the force of your blood against the wall of your blood vessels. C is Cholesterol: There are two kinds of cholesterol in your blood: LDL and HDL. LDL, or “bad” cholesterol, can build up and clog your blood vessels. It can cause a heart attack or stroke. S is for Stopping Smoking: Stop smoking—ask for help or call 1-800-QUIT-NOW. To learn more about the critical link between diabetes and heart disease, please visit YourDiabetesInfo.org/Heart.